Sony has decided to make some extra money on our nostalgia – and a lot they will for sure. 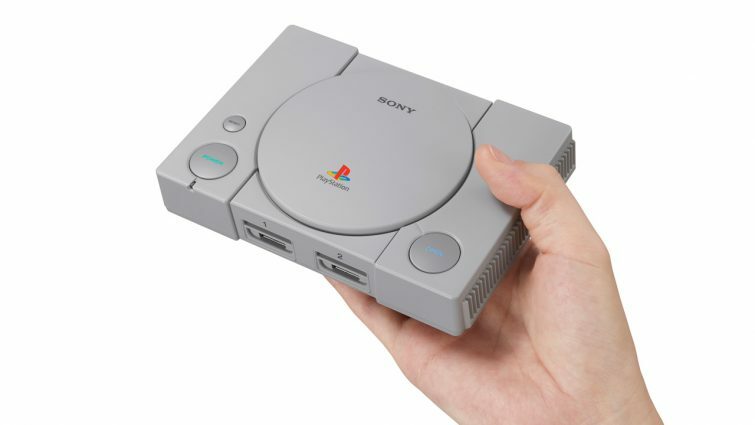 They have just announced the PlayStation Classic, a miniature version of the original PlayStation 1 released over 20 years ago. And really, the thing that shocks me the most here is that it’s been 23 years already! Back to the upcoming PlayStation Classic, it will look just like a tiny little toy version of the PS1. Really, it’s almost as small as the PlayStation’s controller and cute as hell! For now, we have to tell you that Sony unveiled just some of the games we’ll be getting on the PlayStation Classic: Final Fantasy VII, Jumping Flash, Ridge Racer Type 4, Tekken 3, and Wild Arms. All great games, for sure and there might be some even bigger surprises in store for the rest of the games, but Sony’s keeping us waiting right now. The PS Classic will also come with two controllers to help you play the game and will have an HDMI cable for you to be able to actually play these games on your modern TV screen. Finally, you’ll also get a virtual memory card so that you can save your game progress. Sony is surely right to launch the PS One Classic this holiday season (it will go on sale on December 3, 2018), following trend with Nintendo’s NES Classic or SEGA’s Mega Drive Mini and I’m sure I’m not the only one considering to buy it. In the end, it’s nostalgia that pushes us to get it and we’ll do it. The mini version compared to the original. But it’s not really worth it, in my opinion. Most of the gamest hat we loved back in the days will no longer seem that great today. The graphics will be horrible, the AI will be horrible, everything will be horrible in most cases. And just 20 games for one of the most iconic game consoles ever? That’s really WAY too little as there are literally hundreds of amazing games launched for the PS One. Sure, $100 means that you only pay $5 per game (and you also get the console and controllers to pair them up with) so it’s not expensive. But I really feel that Sony should’ve done a bit more here and make it special somehow. Yes, it is special simply because is the freakin’ PS One… but I personally feel that a bit more could’ve been done. What do you think, though? After the instant happiness caused by hearing that what could be one of your favorite consoles is brought back to life – don’t you feel that a bit more could’ve and should’ve been done with the PlayStation Classic?